Being situated some two miles from Neath, the present building is definitely not the first on the site, although past history is somewhat vague. 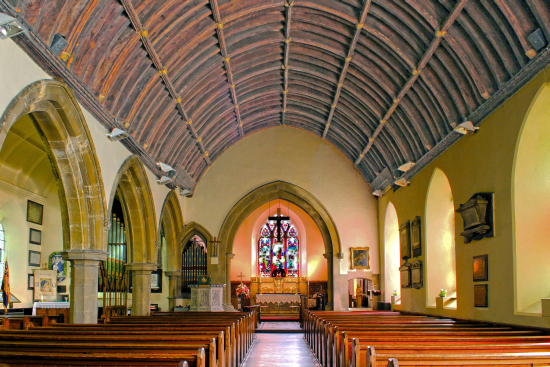 It is a Norman church, the oldest in the Vale of Neath with beautiful stained glass windows, oak panelling and memorial plaques including one dedicated to Johnie Leyshon, who perished in the Titanic. Passing through the double gazed doors, the first thing to see is the “Waggon roof” of oak. It is original and of considerable age. Wagon-roof. cradle-roof constructed of a closely spaced series of double arch-braced trusses, suggesting the shape of a covered wagon or barrel-vault. It may be exposed, plastered, or panelled (wagon-ceiling). The church is also known for the ‘Murder Stone’ welsh stones which marked the graves of murder victims. ‘Murder Stones’ were a fashion during the early nineteenth century and noting the time lapse between the crime and the erection of the stone, they indicate that the trail had gone cold and in each case the crime was unsolved. 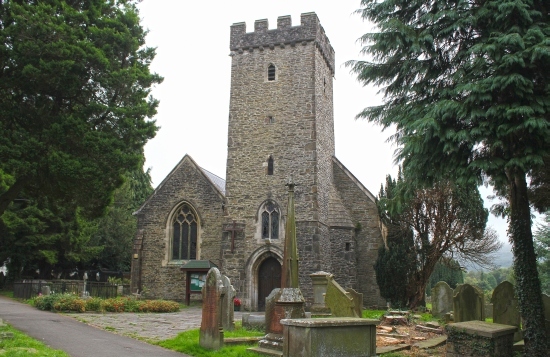 The Parish Church of St. Catwg, Cadoxton has a ﬁne example of a village churchyard. there is a twisted old yew, family vaults, gravestones over two hundred years old. Just inside the gate, alongside the path that leads to the church, you will see the ‘Murder Stone’. It stands out because it is not square to the path. It is at an angle to the others around, positioned to face where the murderer was said to live. It stands out because of the words it displays. It speaks of murder, violence, savage, outcry, blood and judgement. The words on the stone are the words of Elijah Waring, a local Quaker and well-known orator, who commissioned the stone to express the outrage of the community at the murder of Margaret Williams and their belief in a retribution from which there could never be any escape. The Murderer is truly a man without hope or salvation for ‘God hath set his mark upon him'.